The weather at the end of the week suddenly became glorious, warm, and sunny. It was like Moldova was finally having a summer, and the high temperatures approached 21 C (70 F). Itching to explore Moldova outside of Chisinau, we found a place to rent a car. Dan's co-workers assisted in the arrangements, and Saturday morning we showed up at AVR Car Rental ready to pick up our Toyota. Unfortunately, the person who had rented the Toyota earlier in the week still had it. They offered a Hyundai Tucson with Lithuanian plates at the same price of 35 Euro/day. It took almost two hours to rent the Tucson as the vehicle was newly acquired by the rental agency and much paperwork had to be done first. The agency owner apologized for the delay saying he knew that in the US it takes only about five minutes to rent a car. That's not quite true since US rental car companies try to sell you extra insurance and other unnecessary options before you are free to go. Finally, we were on our way. Armed with road maps and Google Maps directions we headed north. 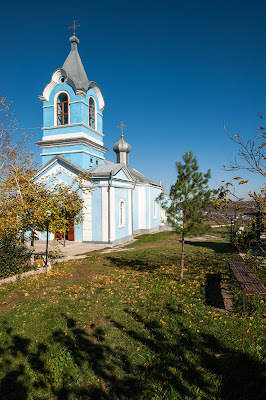 Our first stop was at Ţipova Monastery. 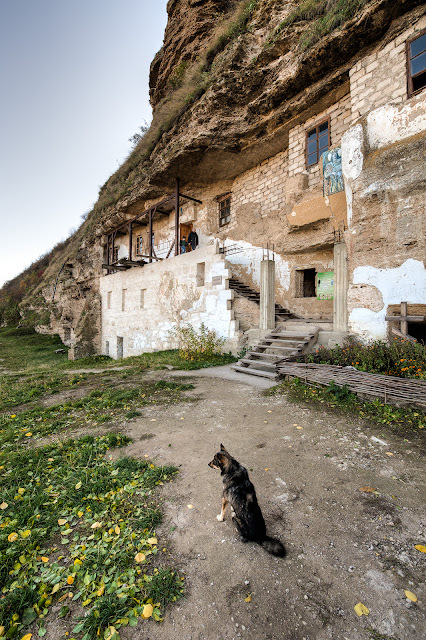 The signs led us toward a church that, although not obvious to us, sits near and above the cave monastery. 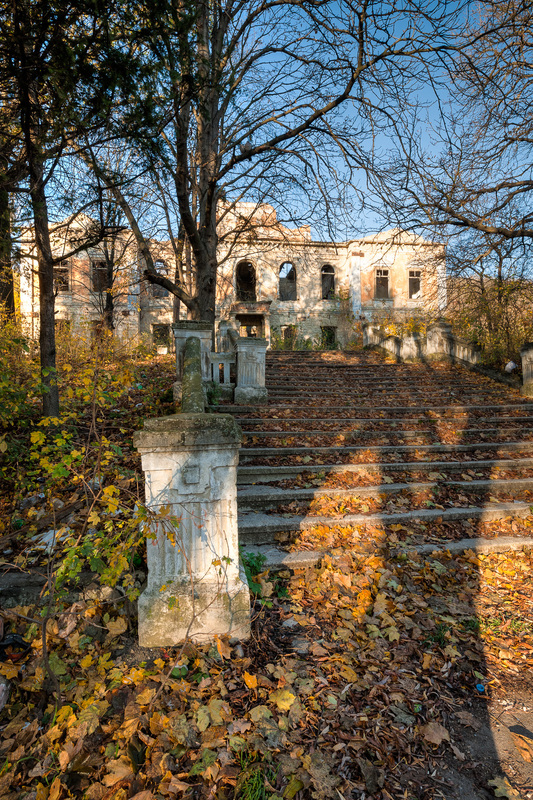 We had to ask a local person in the town of Ţipova where the monastery was located. He led us through the gate, past the blue church, and to the rocky cliff that sits above the Dniestr River. At the point where the trail descends the cliff face, there is a sign pointing out where the cave monastery and various waterfalls are located. 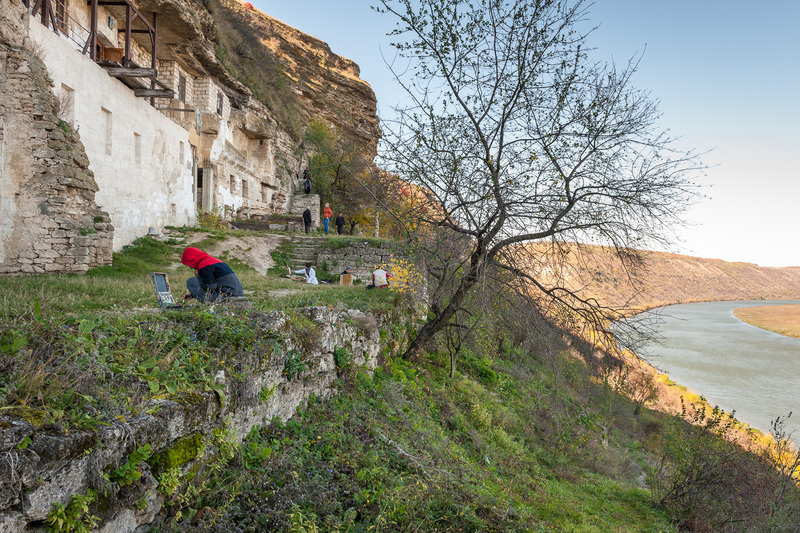 We began the walk down the cliff face on a trail of rocky steps and dirt toward the monastery. The cave monastery was located on the shaded side of the Dniestr River. The sunny side is Transnistria the name of a non-recognized Republic or a state that does not formally exist. Because of the deep shade and the icy wind, it was quite cool at the monastery. Even so, several art students were scattered about the grassy area absorbed in their paintings. The three-level cave monastery was established in 15th century, but has been greatly modified over the centuries. There is a lovely church on the second level that has been enclosed by bricks. 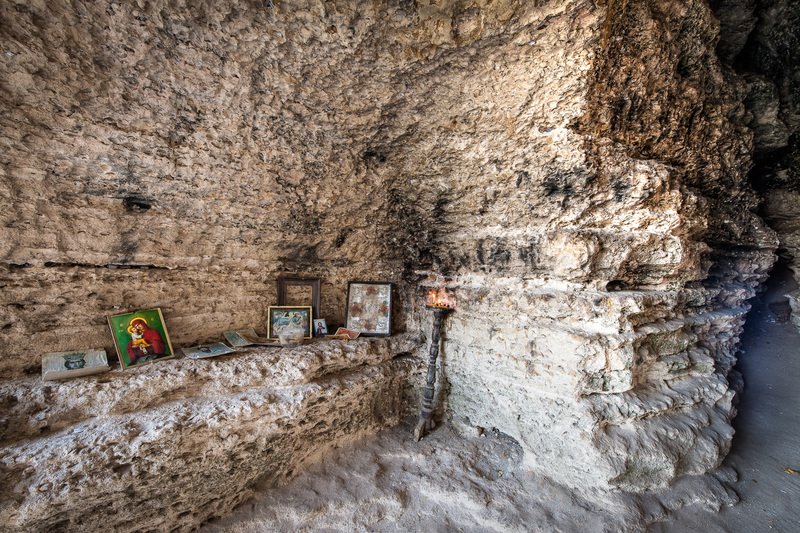 There are several alcoves/cells on the ground level and one of them is being utilized as an informal chapel. 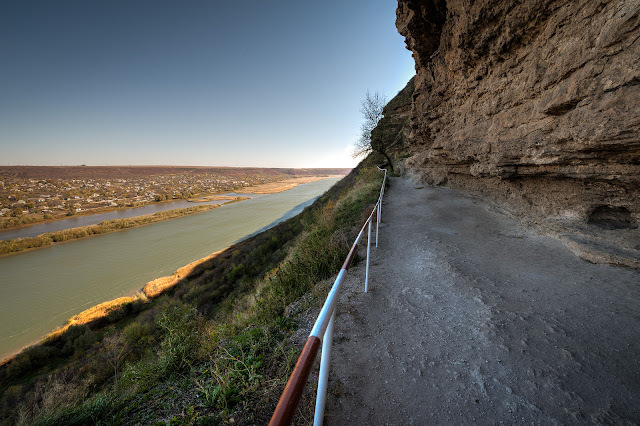 Making our way back to the top of the cliff, we headed toward the town of Soroca. 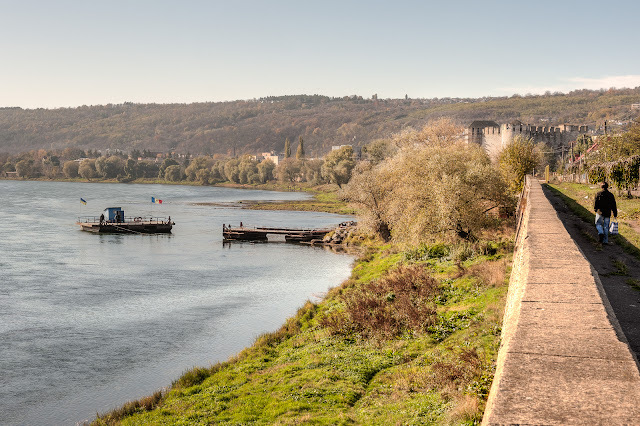 Soroca is about 160 km (less than 100 miles) north of Chisinau over a road that alternates between multi-lane highway and narrow, pot-holed stretches with road construction. The hilly countryside is beautiful with lots of fall color and fields of of dried sunflowers and cornstalks being cleared. The apple harvest was also underway. We arrived in Soroca just as the sun was about to disappear. 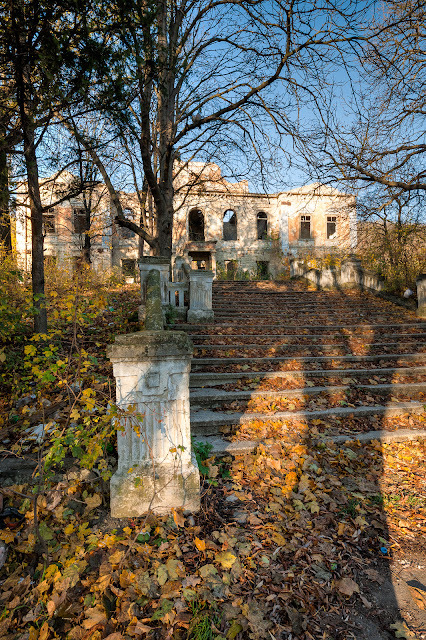 Although Soroca has a population of almost 30,000, Soroca has an abandoned feel to it. Driving in late on Saturday afternoon, most of the business were closed. There was one wedding caravan underway on the streets but few pedestrians. We checked into the Hotel Central. 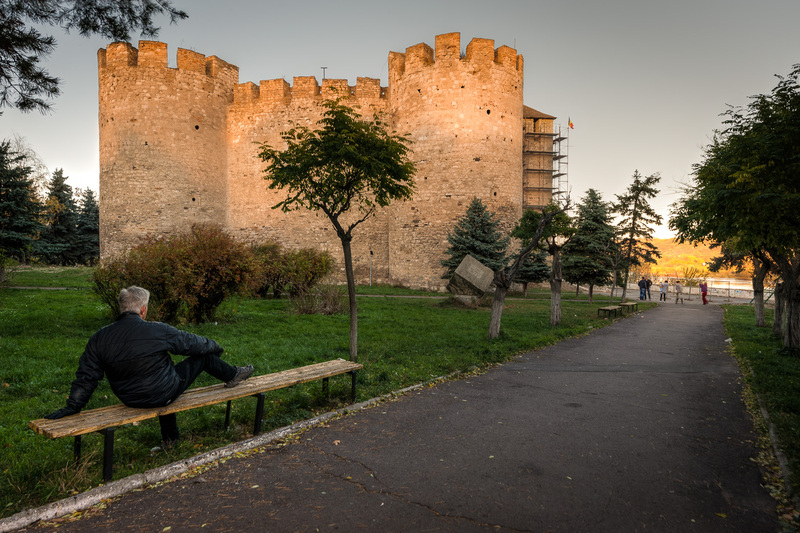 The main tourist site is the Soroca fortress which sits on the western bank of the Dniestr River across from Ukraine. It was closed and under renovation. The temperature in this northern part of Moldova was quite chilly when the sun went down so we went back to the Hotel Central for dinner and the night. The Hotel Central is located on a square that once must have been exciting. The Dacia Cinema sits just across the paved area from the hotel. Unfortunately, the Dacia Cinema closed shortly after the Soviet Union dissolved. Now its front facade serves as a place for a car wash to advertise. 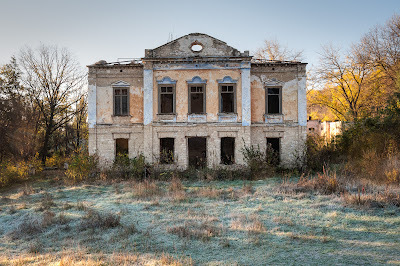 Just to the left of the cinema is another formerly beautiful building that the hotel receptionist said was once the government building that registered marriages. There are several factories in the Soroca area. One factory sews fine clothing for export to Italy. Two factories process/make dairy products. Ironically, at dinner the hotel restaurant had no butter and at breakfast there was no milk for coffee. There was also a working espresso machine, but no coffee beans. Both of the hotel receptionists were very helpful in trying to answer our questions about Soroca. 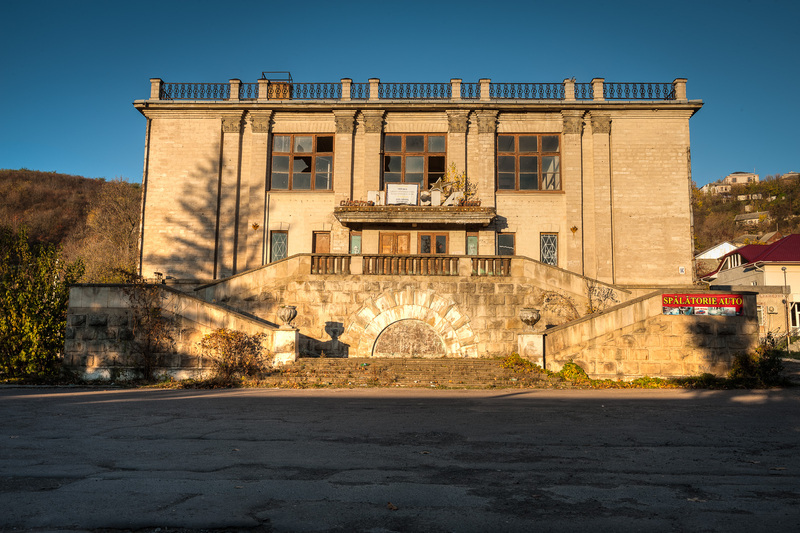 The ethnographic museum was closed on Sunday, but the receptionist called around and found out that the historian, a man named Nikolai, would be at the fortress about noon. We went for a walk along the Dniestr River near the fortress. At this part of the Dniestr River, it is Ukraine that is on the eastern bank. 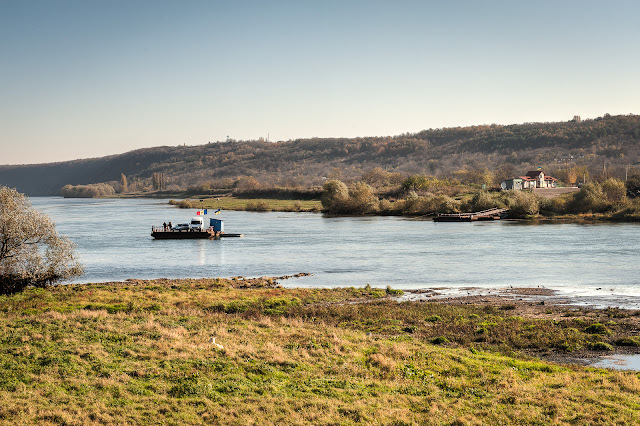 A small ferry with immigration/customs services plies the river crossing between Moldova and Ukraine. Back at the fortress we did meet Nikolai as he was opening the fortress for groups of school children. The fortress dates from the 16th century and was designed by an English architect. It is Norman in style although the Normans were never here. Nikolai said the fortress is 75% original. 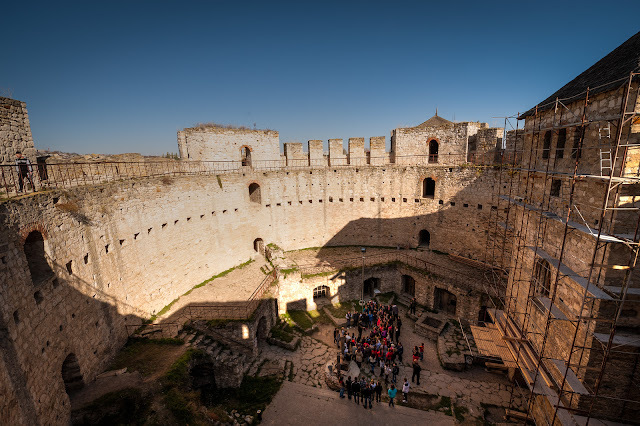 Walking into the fortress before the school children arrived, the fortress had the feel of a perfect, small round jewel box. On the way out of Soroca, we stopped at "The Candle of Gratitude" memorial. 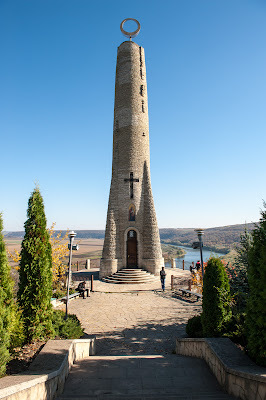 This memorial was built in 2004; I haven't a clue what Soroca was so grateful for that they were motivated to built it. We made the climb of what seemed like thousands of steps up to the candle. The "candle" with its souvenir shop inside wasn't so interesting, but the view was spectacular. 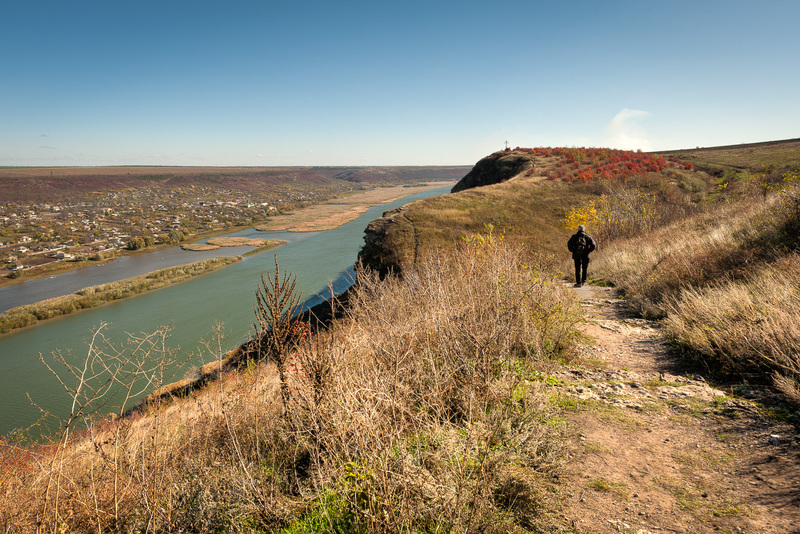 Moldova is the near bank and Ukraine is the far bank of the Dniestr River. Back in Chisinau, we dropped off the car at AVR. Although the gas gauge showed full, the owner and Dan went to a nearby gas station to see if the tank would accept any more gas. It took about 1-1/2 liters more. The car rental agency owner said that if the gas deficit was less than 2 liters, he paid; if the difference was more than 2 liters, the renter paid. We were charged 100 lei (less than $8 USD) for a car wash because, unknown to us, we were to bring the car back clean. All in all, a very successful, enjoyable weekend.